If you caught our last post on iOS push notifications, you might be wondering: what about Android push notification best practices? What makes the best push notification on Android? There are some small but important differences between iOS and Android, so teams working on push notifications for a given OS need to be aware of each platform’s best practices. In a previous study, we found that Android has a 2x higher open rate than iOS, even though iOS users open messages 7x faster than Android. Clearly, there are differences in each OS that are worth taking into account. Some of the trends apply equally to iOS and Android, such as personalization and customized message timing. 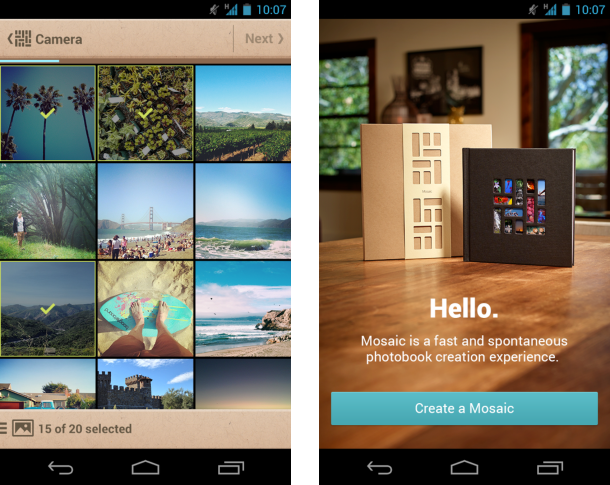 However, other tips and tricks apply exclusively to Android. We’ll cover a few of both in this entry. Our answers are pulled straight from our CEO’s Quora account, so rest assured that it’s advice you can trust. Read on for our top four best practices for Android push notifications! What Is the Best Third-Party Company to Send Push Notifications on Your Android/iOS Apps? You need a partner in success who can help you control and personalize your mobile push campaigns. These are a few of the benefits you should incorporate into your mobile push messaging. Reach the right members of your audience through advanced segmentation and triggering. For example, a 3-day reactivation campaign would only send messages to users who haven’t opened your app in the past 3 days. 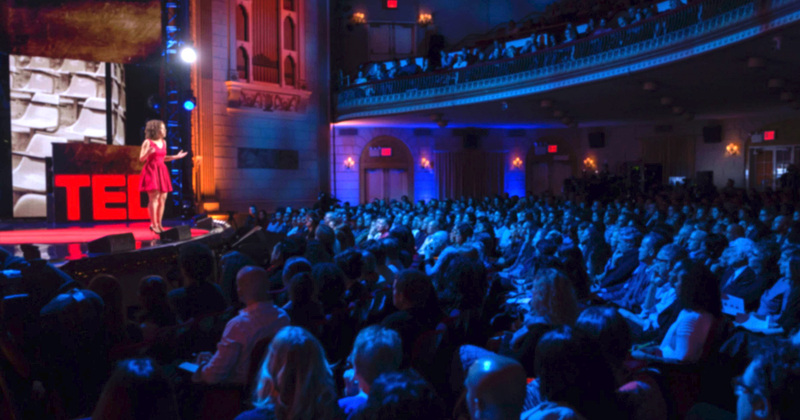 A/B test everything — including your messages! This allows your team to learn what engages users the most, so you can always deliver the right content. Don’t send redundant push messages as you nudge users through the lifecycle. For example, you might want to run a shopping cart abandonment campaign that sends a message to the users who add an item to their cart but don’t complete the checkout within the day. If the person completes the checkout using your app or website, you want to be able to cancel the message automatically. With Leanplum, you can use our Lifecycle Engine to send push notifications in conjunction with email, in-app, and App Inbox messages to engage users on multiple channels. Furthermore, the Lifecycle Engine helps you personalize messaging for each user based on how they’ve engaged with previous messages. 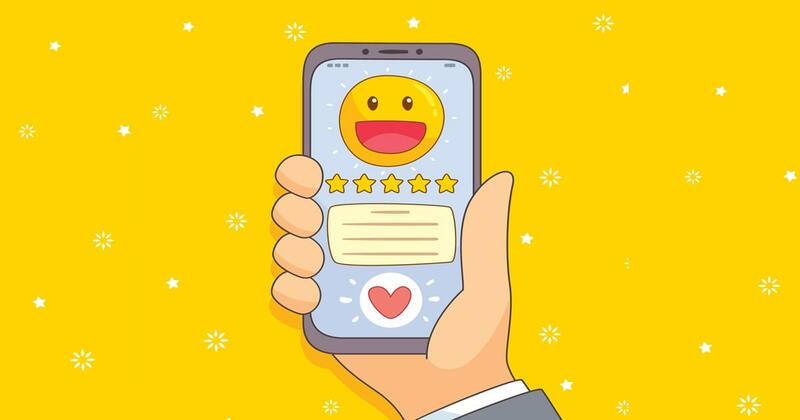 For a practical example, our friends at Mixbook conducted an Android push notification test that resulted in a 14 percent increase to overall purchase conversion. What Is Considered a Rich Push Notification for Mobile Apps? Essentially, a rich push notification means that you can interact or respond to the notification in some way. The specifics of this differ between iOS and Android. On Android, you can customize the appearance of notifications, down to specific icons, titles, messages, size, and more. There’s a lot of customization available for how you can alter the display of the notification, or even if you want to make it a “high priority” heads-up notification. You can read the whole Android doc on notifications here. 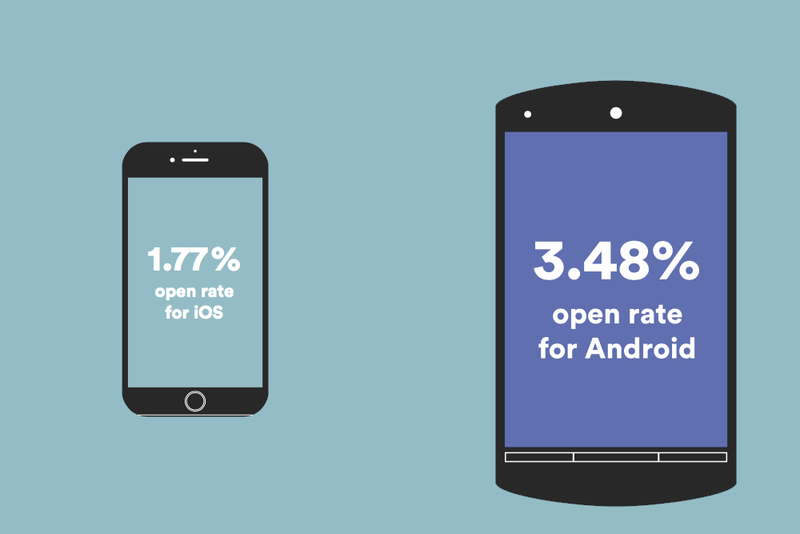 These fundamental differences are probably why there’s a big difference between open rates and times to open for push notifications on iOS vs. Android. As stated earlier, our data as shown that push notification open rates are 2x that of iOS, but users open push notifications 7x faster on iOS than Android. You can get the full data science report here if you’re interested. What Is the Click-Through/Follow-Through Rate on Mobile Push Notifications? Open rates based on geographical location and time of day. Open rates based on message content (personalized vs generic). In North America, users open 4x as many push notifications at 8pm than are being sent. Push notifications with personalized content (e.g. name) see 4x the open rate of generic messages. Push notifications triggered by individual user behaviors produce 9x the open rate of blasts sent immediately. The second report includes data on iOS vs Android, but we’ll include a graphic below for convenience. The general trend is that personalized push notifications outperform generic messages. Users are more likely to open messages with personalized content that are triggered by a specific behavior and sent as the perfect time. Leanplum’s Optimal Time algorithm can help with push notification timing. What Products Help to Increase User Retention on Mobile Apps? There’s a whole data science report on mobile retention strategies that you might want to read. In short, there are many ways to subtly improve mobile retention, but push notifications are the clear winner. Therefore, you should invest in a push notification provider like Leanplum if you’re looking to improve your retention. Apps that send push notifications experience a 20 percent lift in retention. Apps that send messages based on user behavior enjoy a small lift in retention (around 0.5 percent). Apps that personalize their push notification send times see a 7x increase in retention. Overall, push notifications are the key to retention — and within push, timing is the unsung hero. 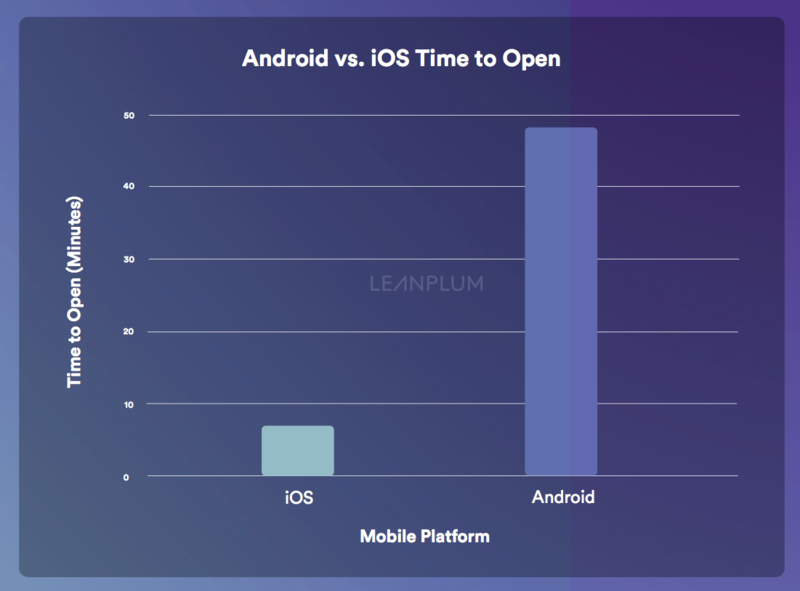 By using a machine learning algorithm like Leanplum’s Optimal Time, you can analyze individual app usage patterns and automatically send messages based on when each individual user is likely to open them. 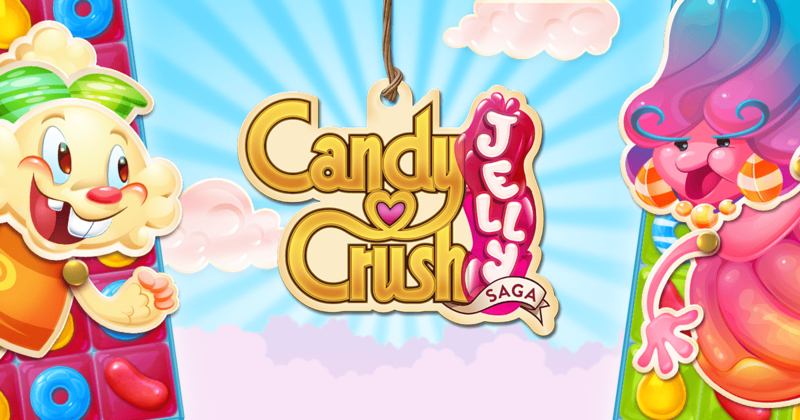 This feature is based on app usage data, so it grows more effective over time. One benefit of using an integrated marketing platform is that you can inform your push notifications with data from the rest of your app. Ideally, you’d want to weave push notifications into personalized lifecycle campaigns, rather than sending one-time blasts with a standalone tool. This means that your messages will be sent based on the user’s behaviors, so a churning user could receive a re-activation message while an active user could receive a special promotion. These dynamic messages are more effective than one-size-fits-all blasts that don’t take the user’s past actions into account. For more insights on the best way to send push notifications on Android, download our Push Notification Playbooks for Retail, Travel, and Media Apps.